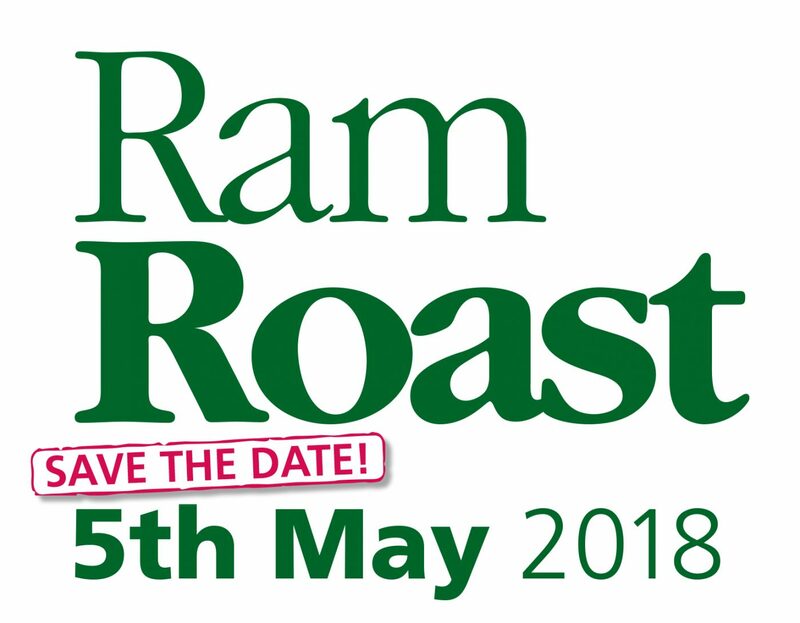 Our 42nd Annual Ram Roast takes place at The Abney Scout & Guide Centre, Newlands Road, Cheadle SK8 2PD on Saturday 5th May 2018. The afternoon kicks off with a procession leaving Brookfield Park, off Wilmslow Road, Cheadle at 1.15pm lead by Northenden Pipe Band, Phoenix Dancers and our Beavers and Cubs being transported on colourful wagons to the main event within the grounds of the Abney Scout & Guide Centre, Abney Hall, Cheadle. Admission to the event is by programme, which cost £1 each and can be bought in advance or on the day. Children under the age of fifteen and uniformed members of the Scout Association get in FREE. The programme includes a Lucky Programme Draw with prizes donated by local businesses. Official opening is at 2.15pm. During the afternoon there are displays in the arena with around 30 stalls and activities for you to enjoy from bouncing castles, tombola, refreshments – including a fresh scone and cup of tea/coffee in our refreshments hall. Taste our famous ‘Ram Butties’, hot dogs & burgers, candy floss or try your luck on the coconut shy, chocolate tombola, climbing wall have your face painted, bedding plants and lots more, something for every age from the young to the old. Something for every age to enjoy from the young to the old. 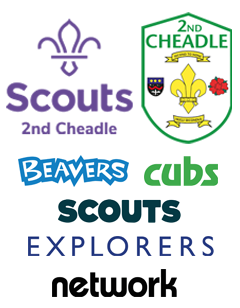 All monies raised goes directly back into the Scout Group, helping to provide headquarters, equipment and activities for around 200 Beavers, Cubs, Scouts, Explorers and Network members within the Cheadle area. Check out www.ramroast.co.uk website for the latest information. 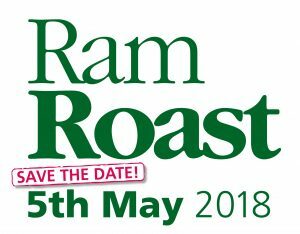 Would your business or place of work like to advertise in this years 40th Anniversary Ram Roast Programme? We print and sell 2,000 programmes prior to the event and on the day and offer a free artwork design should you require. Online advertising at www.ramroast.co.uk at a special anniversary rate of £30. Should you wish to advertise please email infor@2ndcheadlescoutgroup.co.uk or via twitter @2ndCheadle. All previous advertisers have been contacted this week. On Sunday 12th November we will join the Churches and other Organisations in Cheadle for our Remembrance Day Parade and Service at the Cenotaph on Cheadle Green. We all meet at Massie Street car park, Cheadle at 10.20am on Sunday 12th November and ask that all members come smartly dressed in full uniform, so please ensure you wear warm items of clothing under your shirts or jumpers. School trousers and cleaned polished shoes, not trainers please. 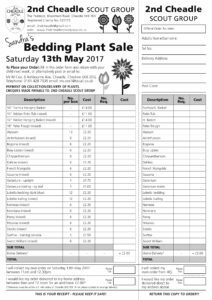 Order forms are now available for our annual Bedding Plant Sale, which this year is on Saturday 18th May 2013. 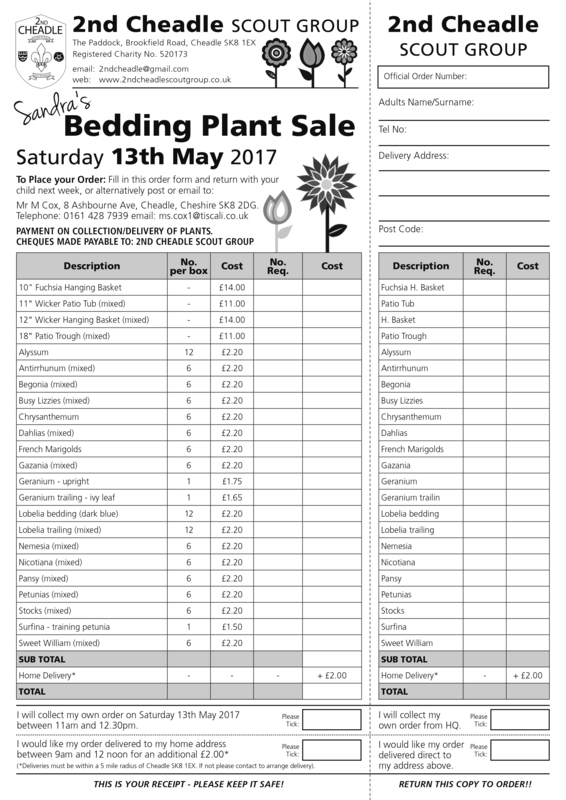 Please post or email completed order forms back to the address on the form. All orders should be sent in one week prior to the event. Members of 2nd Cheadle Scout Group are invited to a Bonfire and Fireworks event at our HQ on Friday 9th November 2012.